The basic, economical, rectilinear form takes on a decidedly different appearance with the addition of the undulating balconies of varying shape and size. More than just adornment, the shape and placement of the balconies provide sufficient disruption in wind force to eliminate the need for a tuned mass damper in the building and will make the balconies usable even on the uppermost floors. 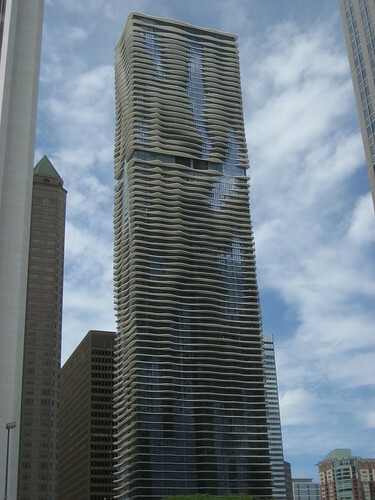 The developer is Magellan Development Group of Chicago. The building is 82 stories and will house commercial tenants, residential rental units and residential condominiums. Additional information can be found at en.wikipedia.org/wiki/Aqua_(skyscraper) or www.lifeataqua.com/. Follow up article on yesterday’s Council decisions regarding the Planning Department’s recommendation that four sites it identified on the downtown peninsula be allowed to penetrate existing view corridors and increased building heights in Chinatown/Gastown. 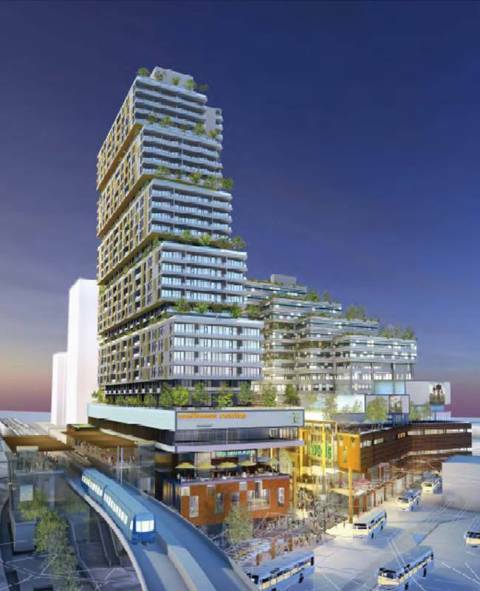 via CBC News – British Columbia – Vancouver rejects downtown high-rise proposals. via Proposed height increases in Chinatown not enough, says group. An outsider’s perspective on the current state of the city, Vancouverism and growth in Surrey. In this guest editorial to today’s Vancouver Sun, Jean Swanson, coordinator of the Carnegie Community Action Project, adds another voice to the discussion around the opening of the Woodward’s project.